Amyotrophic lateral sclerosis (ALS) is a neurodegenerative disease characterized by loss of motor neurons in the spinal cord, brainstem, and motor cortex. The cause of the disease is still not known. ALS is not curable, but a number of important therapies are available. In 1999, the American Academy of Neurology (AAN) published an evidence-based practice parameter for managing patients with ALS.1 Since that publication, there have been some important new studies, including a randomized controlled trial of noninvasive ventilation in ALS.2 Although only 1 drug, riluzole, has shown modest benefit and received US Food and Drug Administration approval (see below), there have been advances in symptomatic treatment for patients with this disease. In this revision, we update the riluzole practice advisory and address other management issues for care of patients with ALS. This article addresses riluzole, lithium, nutrition, and respiratory care, while a companion article addresses breaking the news, symptom management, palliative care, cognitive and behavioral impairment, multidisciplinary clinics, and communication. We searched OVID, MEDLINE EMBASE, CINAHL, Science Citation Index, BIOETHICSLINE, International Pharmaceutical Abstracts (IPAB), OVID Current contents, Medline-ProQuest, EIFL, and INVEST from 1998 though September 2007, combining the words ALS, Lou Gehrig’s disease, and motor neuron disease with the following words using AND: respiratory, respiratory failure, respiratory insufficiency, nutrition, enteral nutrition, malnutrition, weight loss, gastrostomy, clinical trials, mechanical insufflation-exsufflation, high frequency chest wall oscillation, Vest, Bipap, tracheostomy ventilation, dysphagia, mechanical ventilation, noninvasive ventilation, hypoventilation, bronchial secretions, sleep-disordered breathing, and breath stacking. We reviewed the abstracts of these articles and examined 142 articles in their entirety. The diagnostic and therapeutic classification schemes used to grade the articles are summarized in appendices e-3a and e-3b on the Neurology® Web site at www.neurology.org. Recommendations were based on the levels of evidence as described in appendix e-4. What is the effect of riluzole on slowing the disease process or prolonging survival in ALS? Riluzole is approved for slowing disease progress in ALS. This drug was the subject of a practice advisory published by the AAN in 1997.3 The practice advisory recommended riluzole 50 mg BID to prolong survival for those with definite or probable ALS less than 5 years duration, with forced vital capacity (FVC) >60%, and without tracheostomy (Level A). Expert opinion suggested potential benefit for those with suspected or possible ALS with symptoms longer than 5 years, FVC <60%, and tracheostomy for prevention of aspiration only. Since 1997, 2 other controlled clinical trials have been published (Class I)4,5 and all of the available evidence has been reviewed.6 Riluzole has a modest beneficial effect in slowing disease progression (prolonged survival of 2–3 months) based on 4 Class I trials. The number needed to treat to delay 1 death until after 12 months was 11. However, 5 studies using large databases spanning 5 to 10 years have suggested that treatment with riluzole might be associated with a prolonged survival of 6 months (Class II),7 10 months (Class III),8 12 months (Class III),9 14 months (Class III),10 or even 21 months (Class III).11 These cohort studies had longer-term follow-up than the clinical trials, but are subject to greater bias. After 10 years of patient experience, the drug appears to be safe but expensive. Fatigue and nausea are known side effects. Riluzole is safe and effective for slowing disease progression to a modest degree in ALS (4 Class I studies). Riluzole should be offered to slow disease progression in patients with ALS (Level A). Does lithium carbonate prolong survival or slow disease progression in ALS? A trial of lithium carbonate in ALS compared 16 patients treated with riluzole and lithium carbonate with 28 patients treated with riluzole alone (Class III).12 Mortality was lower and disease progression was slower in treated patients. The small sample size, lack of adequate blinding, and other design issues are of great concern. There are inadequate data on the effectiveness of lithium carbonate (1 Class III study). There are insufficient data at this time to support or refute treatment with lithium carbonate in patients with ALS (Level U). In ALS, factors that restrict adequate nutrition develop insidiously and progressively worsen. The functional consequences are choking, aspiration, weight loss, and dehydration. Dysphagia is a symptom experienced by the patient and is prima facie evidence of swallowing dysfunction. Videofluoroscopic evaluation of the swallowing mechanism may identify food textures that can be handled successfully. However, it is not a required test to establish the presence or absence of dysphagia. *e.g., Bulbar questions in the Amyotrophic Lateral Sclerosis Functional Rating Scale, or other instrument. †Prolonged meal time; ending meal prematurely because of fatigue; accelerated weight loss due to poor caloric intake; family concern about feeding difficulties. ‡Percutaneous endoscopic gastrostomy: rule out contraindications. 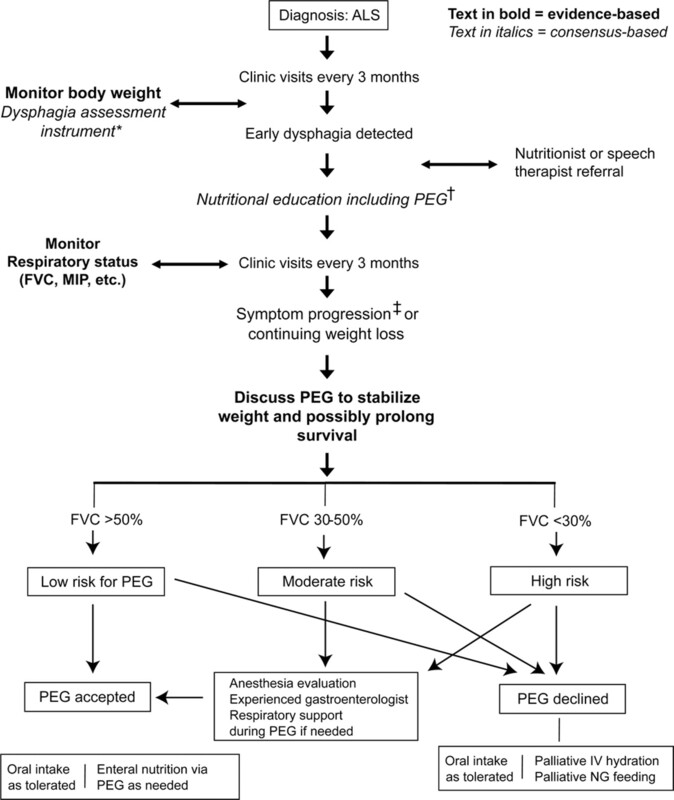 What is the effect of enteral nutrition administered via PEG on weight stability? In 9 studies, a total of 469 patients with ALS received enteral nutrition via PEG.14–22 Using patients as their own controls, 7 Class III studies demonstrated either weight stabilization or modest weight gain over 2–24 months.14–16,18,19,21,22 In 2 Class II studies17,20 in which PEG refusers served as controls, weight stabilization was demonstrated in the PEG group vs continued weight loss in controls (p = 0.03). Enteral nutrition administered via PEG is probably effective in stabilizing body weight/body mass index (2 Class II, 7 Class III studies). In patients with ALS with impaired oral food intake, enteral nutrition via PEG should be considered to stabilize body weight (Level B). When is PEG indicated in ALS? What is the efficacy of nutritional support via PEG in prolonging survival? Studies using appropriate controls or multivariate analysis demonstrated that PEG is probably effective in prolonging survival in ALS, although insufficient data exist to quantitate the survival advantage (2 Class II studies). PEG should be considered for prolonging survival in patients with ALS (Level B). What is the effect of enteral nutrition delivered via PEG on quality of life? There is no evidence regarding the effect of PEG on quality of life. No evidence exists regarding the effect of enteral nutrition on quality of life. There are insufficient data to support or refute PEG for improving quality of life in patients with ALS (Level U). What is the efficacy of vitamin and nutritional supplements on prolonging survival or quality of life? High-dose vitamins, minerals, and other nutriceuticals are used by more than 79% of patients with ALS (Class III).27 Only creatine and vitamin E have been examined for efficacy. Creatine, in doses of 5–10 g daily, is established as ineffective in slowing the rate of progression or in improving survival in ALS (2 Class I studies). Vitamin E 5,000 mg/day plus riluzole is probably ineffective in improving survival or functional outcomes (1 Class I study). Vitamin E (1,000 mg/day plus riluzole) was marginally effective in slowing the progression of ALS from milder to more severe ALS health states using a single measure but is ineffective using multiple other measures (1 Class I study). Creatine, in doses of 5–10 g daily, should not be given as treatment for ALS because it is not effective in slowing disease progression (Level A). High-dose vitamin E should not be considered as treatment for ALS (Level B), while the equivocal evidence regarding low-dose vitamin E permits no recommendation (Level U). The diagnosis and management of respiratory insufficiency is critical because most deaths from ALS are due to respiratory failure. Published guidelines for respiratory care were based on clinical experience, expert opinion, and observational research.1,32,33 While many questions remain unanswered, there have recently been several controlled studies that provide evidence to guide management (figure 2). PFT = pulmonary function tests; PCEF = peak cough expiratory flow; NIV = noninvasive ventilation; SNP = sniff nasal pressure; MIP = maximal inspiratory pressure; FVC = forced vital capacity (supine or erect); Abnl.nocturnal oximetry = pO2 <4% from baseline. *Symptoms suggestive of nocturnal hypoventilation: frequent arousals, morning headaches, excessive daytime sleepiness, vivid dreams. †If NIV is not tolerated or accepted in the setting of advancing respiratory compromise, consider invasive ventilation or referral to hospice. What are the optimal pulmonary tests to detect respiratory insufficiency? Nocturnal desaturations <90% for 1 cumulative minute was a more sensitive indicator of nocturnal hypoventilation than either FVC or MIP (Class III).36 FVC correlated poorly with symptoms of nocturnal hypoventilation and desaturation (Class III).37 Nocturnal oximetry correlated with survival (Class IV)38 (mean O2 saturations <93 mm Hg were associated with mean survival of 7 months vs 18 months when mean O2 saturation >93 mm Hg). The sniff transdiaphragmatic pressure (sniff Pdi) detected hypercapnia (earlobe blood gas CO2 tension >6 kPa [normal <6]) with a sensitivity of 90% and a specificity of 87% (Class III).e1 Sniff nasal pressure (SNP) showed greater predictive power than either FVC or MIP. The sniff Pdi and the percent predicted SNP were both correlated with the apnea/hypopnea index on polysomnography. No test had predictive power in patients with bulbar weakness. SNP <40 cm H2O correlated with nocturnal hypoxemia (Class III).e2 When SNP was less than 30 cm, median survival was 3 months. In addition, SNP was more reliably recorded at later stages of ALS than either FVC or MIP. Elevated bicarbonate and low serum chloride correlated with respiratory symptoms and were predictive of death within 5 months in 8/10 patients (Class III).e3 Bach et al. (Class III)e4 showed that tracheostomy or death was highly likely within 2 months of a decrease in daytime SpO2 <95% that could not be corrected by noninvasive ventilation (NIV). Nocturnal oximetry and MIP are possibly more effective in detecting early respiratory insufficiency than erect FVC (2 Class III studies). Supine FVC is possibly more effective than erect FVC in detecting diaphragm weakness and correlates better with symptoms of nocturnal hypoventilation (2 Class III studies). Sniff Pdi and SNP are possibly effective in detecting hypercapnia and nocturnal hypoxemia (2 Class III studies). Nocturnal oximetry may be considered to detect hypoventilation (regardless of the FVC) (Level C). Supine FVC and MIP may be considered useful in routine respiratory monitoring, in addition to the erect FVC (Level C). SNP may be considered to detect hypercapnia and nocturnal hypoxemia (Level C). Does NIV improve respiratory function or increase survival? In a randomized controlled study, patients using NIV experienced a median survival benefit of 205 days (Class I).2 NIV was initiated based on orthopnea with an MIP <−60 cm or symptomatic hypercapnia. No survival benefit was seen in patients with poor bulbar function. NIV is probably effective in prolonging survival (1 Class I, 3 Class III studies) and in slowing the rate of FVC decline (1 Class I, 1 Class III study). NIV should be considered to treat respiratory insufficiency in ALS, both to lengthen survival and to slow the rate of FVC decline (Level B). How do invasive and noninvasive ventilation affect quality of life? NIV had a positive impact on quality of life (QOL) in 4 Class III studies.36,e9-e11 There was improvement in energy, vitality,e9,e10 shortness of breath, daytime somnolence, depression, concentration problems, sleep quality, and physical fatigue for 10 months or more.e11 In one Class III study,2 patients using NIV had increased duration of QOL above 75% of baseline and increased time-weighted mean improvement in QOL. NIV is possibly effective in raising QOL for patients with ALS who have respiratory insufficiency (5 Class III studies). TIV is possibly effective in preserving QOL for patients with ALS, but possibly with a greater burden for their caregivers (2 Class III studies). NIV may be considered to enhance QOL in patients with ALS who have respiratory insufficiency (Level C). TIV may be considered to preserve QOL in patients with ALS who want long-term ventilatory support (Level C). What factors influence acceptance of invasive and noninvasive ventilation? Noncompliance with NIV was seen in 75% of patients with ALS and frontotemporal dysfunction vs 38% in patients with classic ALS (relative risk 2.0) (Class III).e15 There was low compliance in bulbar patients (Class III)2,e16 but cognitive/executive function was not described. Orthopnea was a strong predictor of benefit and also better compliance with NIV (Class III).e9 NIV use correlated with symptoms of orthopnea and dyspnea as well as with the use of PEG, speech devices, and riluzole (Class III).e17 Young age and preserved upper limb function also predicted better compliance. Nocturnal oximetry is possibly effective in detecting early respiratory insufficiency and the early use of NIV possibly increases compliance (2 Class III studies). Bulbar involvement and executive dysfunction possibly lower compliance with NIV (2 Class III studies). NIV may be considered at the earliest sign of nocturnal hypoventilation or respiratory insufficiency in order to improve compliance with NIV in patients with ALS (Level C). What is the efficacy of targeted respiratory interventions for clearing secretions? Mechanical insufflation/exsufflation (MIE) increased the PCEF by 17% in healthy controls, 26% in bulbar patients, and 28% in nonbulbar patients (Class III).e20 Manually assisted cough increased flow by 11% in bulbar and 13% in nonbulbar patients. MIE via tracheostomy tube and an inflated cuff was more effective in eliminating airway secretions than ordinary suctioning (Class III).e21 SpO2, peak inspiratory pressure, mean airway pressure, and work of breathing all improved and patients reported that MIE was more comfortable and effective. MIE is possibly effective for clearing upper airway secretions in patients with ALS who have reduced peak cough flow, although the clinically meaningful difference is unknown (4 Class III studies). HFCWO is unproven for adjunctive airway secretion management (2 Class III studies with conflicting results). MIE may be considered to clear secretions in patients with ALS who have reduced peak cough flow, particularly during an acute chest infection (Level C). There are insufficient data to support or refute HFCWO for clearing airway secretions in patients with ALS (Level U). Medications with mucolytics like guaifenesin or N-acetylcysteine, a B-receptor antagonist (such as metoprolol or propanolol), nebulized saline, or an anticholinergic bronchodilator such as ipratropium are widely used; however, no controlled studies exist in ALS. This evidence-based review indicates some progress in evaluating new therapies for patients with ALS. More high-quality studies have been reported leading to more confident recommendations regarding the value of NIV and PEG. It is one thing to publish an evidence-based practice parameter for the management of patients with ALS, and it is quite another to be able to track adherence in practice and to determine whether the publication of evidence-based guidelines has changed outcomes. The ALS patient CARE database was developed with the hope of standardizing new and effective therapies for patients with ALS and tracking outcomes to raise the standard of care.e26 Data obtained from the ALS CARE program have shown that the underutilization of many therapies (especially PEG and NIV) has persisted in the years since the original practice parameter on this topic, though there have been gains. These findings suggest that an evidence-based practice parameter may over time become more widely accepted and change practice. However, the persistent underutilization of therapies that improve survival and quality of life poses a challenge for ALS clinicians to continue to raise the standard of care for patients with ALS. Study whether lithium slows disease progression or prolongs survival in ALS in larger clinical trials. Develop ALS-specific indications for nutritional adequacy in ALS and for PEG and RIG. Study the optimal timing of nutritional therapy administered via PEG or RIG. Conduct clinical studies of novel antioxidants and supplements. Evaluate SNP as a criterion for NIV initiation. Evaluate the impact of early NIV initiation on survival and quality of life. Assess the impact of executive dysfunction on NIV compliance. Evaluate the effect of hypoventilation on executive dysfunction. Compare techniques for clearing upper airway secretions at various stages of respiratory and bulbar dysfunction. Evaluate pulmonary tests, compliance with NIV, and outcomes in patients with bulbar dysfunction. The authors thank additional members of the ALS Practice Parameter Task Force: Thomas Getchius, AAN staff; Gary Gronseth, MD; Dan H. Moore, PhD; Sharon Matland; Valerie Cwik; Larry Brower; and Sid Valo. Dr. Miller serves on the editorial board of the ALS Journal; received a speaker honorarium from the AANEM; served as a consultant to Celgene, Knopp Neurosciences Inc., Teva Pharmaceutical Industries Ltd., Taiji Biomedical, Inc., Sanofi-Aventis, Novartis, and Neuraltus; and receives research support from the NIH [R01 NS 44887 (PI)] and the Muscular Dystrophy Association (PI). Dr. Jackson serves as a consultant to Knopp Neurosciences Inc.; and receives research support from Knopp Neurosciences Inc., Insmed Inc., Solstice Neurosciences, Inc., the ALS Association, and the NIH NINDS [U01 NS042685-0 (Site PI), R01NS045087-01A2 (Site PI), and N01-AR-2250 (Site PI)]. Dr. Kasarskis serves as an Associate Editor for Amyotrophic Lateral Sclerosis; has received honoraria from the American Institute for Biological Studies (grant reviews); served as a consultant to Acceleron Pharma; holds equity in Amgen; and receives research support from the NIH/NINDS [R01-NS045087 (PI) and 1U01 NS049640 (Site PI). Dr. England serves as an Associate Editor for Current Treatment Options in Neurology; received a speaker honorarium from Teva Pharmaceutical Industries Ltd.; and serves as a consultant to Talecris. Ms. Forshew has served on a scientific advisory board for the ALS Association and receives research support from the Muscular Dystrophy Association. Dr. Johnston reports no disclosures. Dr. Kalra receives research support from the ALS Association of America and the ALS Society of Canada. Dr. Katz has received research support from Pfizer Inc. Dr. Mitsumoto served on scientific advisory boards for Avanir Pharmaceuticals, Knopp Neurosciences Inc., Neuralstem, Inc., Aisai Communication Technology Co., Ltd., and Otsuka Pharmaceutical Co., Ltd.; and receives research support from Avanir Pharmaceuticals, Teva Pharmaceutical Industries Ltd., Knopp Neurosciences Inc., Sanofi-Aventis, Athena Diagnostics, Inc., BioScrip, and the NIH/NINDS [DNA repository as a supplement and NIEHS Center grant]. Dr. Rosenfeld serves on the editorial board of Amyotrophic Lateral Sclerosis and has served as a consultant to Solstice Neurosciences, Inc. and Avicena Group, Inc. Dr. Shoesmith receives research support from the Muscular Dystrophy Association and her spouse is employed by Biovail Pharmaceuticals Canada. Dr. Strong serves on the editorial board of Amyotrophic Lateral Sclerosis. Dr. Woolley has received research support from Pfizer Inc., Eisai Inc., and the ALS Association (Co-I). This statement is provided as an educational service of the American Academy of Neurology. It is based on an assessment of current scientific and clinical information. It is not intended to include all possible proper methods of care for a particular neurologic problem or all legitimate criteria for choosing to use a specific procedure. Neither is it intended to exclude any reasonable alternative methodologies. The AAN recognizes that specific patient care decisions are the prerogative of the patient and the physician caring for the patient, based on all of the circumstances involved. The clinical context section is made available in order to place the evidence-based guideline(s) into perspective with current practice habits and challenges. No formal practice recommendations should be inferred. Appendices e-1–e-4, tables e-1 and e-2, and references e1– e26 are available on the Neurology® Web site at www.neurology.org. Approved by the Quality Standards Subcommittee on November 5, 2008; by the Practice Committee on February 19, 2009; and by the AAN Board of Directors on July 30, 2009. Received February 19, 2009. Accepted in final form July 29, 2009. Miller RG, Rosenberg JA, Gelinas DF, et al. Practice parameter: the care of the patient with amyotrophic lateral sclerosis (an evidence-based review): report of the Quality Standards Subcommittee of the American Academy of Neurology: ALS Practice Parameters Task Force. Neurology 1999;52:1311–1323. Bourke SC, Tomlinson M, Williams TL, Bullock RE, Shaw PJ, Gibson GJ. Effects of non-invasive ventilation on survival and quality of life in patients with amyotrophic lateral sclerosis: a randomised controlled trial. Lancet Neurol 2006;5:140–147. Practice advisory on the treatment of amyotrophic lateral sclerosis with riluzole: report of the Quality Standards Subcommittee of the American Academy of Neurology. Neurology 1997;49:657–659. Bensimon G, Lacomblez L, Delumeau JC, Bejuit R, Truffinet P, Meininger V. A study of riluzole in the treatment of advanced stage or elderly patients with amyotrophic lateral sclerosis. J Neurol 2002;249:609–615. Yanagisawa N, Tashiro K, Tohgi H, et al. Efficacy and safety of riluzole in patients with amyotrophic lateral sclerosis: double-blind placebo-controlled study in Japan. Igakuno Ayumi 1997;182:851–866. Miller RG, Mitchell JD, Lyon M, Moore DH. Riluzole for amyotrophic lateral sclerosis (ALS)/motor neuron disease (MND). Cochrane Database Syst Rev 2007;CD001447. Meininger V, Bensimon G, Bradley WR, et al. Efficacy and safety of xaliproden in amyotrophic lateral sclerosis: results of two phase III trials. Amyotroph Lateral Scler Other Motor Neuron Disord 2004;5:107–117. Mitchell JD, O’Brien MR, Joshi M. Audit of outcomes in motor neuron disease (MND) patients treated with riluzole. Amyotroph Lateral Scler 2006;7:67–71. Traynor BJ, Alexander M, Corr B, Frost E, Mahon L, Hardiman O. Riluzole and prognosis in ALS: Findings of the Irish ALS register over a five year study period (1996–2000). Amyotroph Lateral Scler Other Motor Neuron Disord 2001;2(suppl 2):43–44. Abstract. Brooks BR, Belden DS, Roelke K, et al. Survival in non-riluzole treated amyotrophic lateral sclerosis (ALS): motor neuron disease (MND) patients with onset before and since 1996 is identical: a clinic-based epidemiological study. Amyotroph Lateral Scler Other Motor Neuron Disord 2001;2:60–61. Abstract. Turner MR, Bakker M, Sham P, Shaw CE, Leigh PN, Al-Chalabi A. The King’s Database 1999–2000: an analysis of the effect on survival of interventions in amyotrophic lateral sclerosis. Amyotroph Lateral Scler Other Motor Neuron Disord 2001;2:43. Abstract. Fornai F, Longone P, Cafaro L, et al. Lithium delays progression of amyotrophic lateral sclerosis. Proc Natl Acad Sci USA 2008;105:2052–2057. Loser C, Aschl G, Hebuterne X, et al. ESPEN guidelines on artificial enteral nutrition–percutaneous endoscopic gastrostomy (PEG). Clin Nutr 2005;24:848–861. Kasarskis EJ, Scarlata D, Hill R, Fuller C, Stambler N, Cedarbaum JM. A retrospective study of percutaneous endoscopic gastrostomy in ALS patients during the BDNF and CNTF trials. J Neurol Sci 1999;169:118–125. Chio A, Cucatto A, Terreni A, et al. Percutaneous endoscopic gastrostomy in amyotrophic lateral sclerosis: Effects on nutritional status and survival. Neurol 1998;50(suppl 4):AB30. Abstract. Chio A, Finocchiaro E, Meineri P, Bottacchi E, Schiffer D. Safety and factors related to survival after percutaneous endoscopic gastrostomy in ALS: ALS Percutaneous Endoscopic Gastrostomy Study Group. Neurology 1999;53:1123–1125. Del Piano M, Occhipinti P, Orsello M, Ballare M. Percutaneous endoscopic gastrostomy (PEG) reduces complications and improves survival in amyotrophic lateral sclerosis (ALS). Gastrointest Endosc 1999;49:AB192. Abstract. Desport JC, Mabrouk T, Bouillet P, Perna A, Preux PM, Couratier P. Complications and survival following radiologically and endoscopically-guided gastrostomy in patients with amyotrophic lateral sclerosis. Amyotroph Lateral Scler Other Motor Neuron Disord 2005;6:88–93. Desport JC, Preux PM, Truong CT, Courat L, Vallat JM, Couratier P. Nutritional assessment and survival in ALS patients. Amyotroph Lateral Scler Other Motor Neuron Disord 2000;1:91–96. Mazzini L, Corra T, Zaccala M, Mora G, Del Piano M, Galante M. Percutaneous endoscopic gastrostomy and enteral nutrition in amyotrophic lateral sclerosis. J Neurol 1995;242:695–698. Mitsumoto H, Davidson M, Moore D, et al. Percutaneous endoscopic gastrostomy (PEG) in patients with ALS and bulbar dysfunction. Amyotroph Lateral Scler Other Motor Neuron Disord 2003;4:177–185. Rozier A, Ruskone Fourmestraux A, Rosenbaum A, Delvigne JM, Besancon F, Meininger V. [Role of percutaneous endoscopic gastrostomy in amyotrophic lateral sclerosis] [in French]. Rev Neurol 1991;147:174–176. Mathus-Vliegen LM, Louwerse LS, Merkus MP, Tytgat GN, Vianney de Jong JM. Percutaneous endoscopic gastrostomy in patients with amyotrophic lateral sclerosis and impaired pulmonary function. Gastrointest Endosc 1994;40:463–469. Chio A, Mora G, Leone M, et al. Early symptom progression rate is related to ALS outcome: a prospective population-based study. Neurology 2002;59:99–103. Shaw AS, Ampong MA, Rio A, et al. Survival of patients with ALS following institution of enteral feeding is related to pre-procedure oximetry: a retrospective review of 98 patients in a single centre. Amyotroph Lateral Scler 2006;7:16–21. Forbes RB, Colville S, Swingler RJ. Frequency, timing and outcome of gastrostomy tubes for amyotrophic lateral sclerosis/motor neurone disease: a record linkage study from the Scottish Motor Neurone Disease Register. J Neurol 2004;251:813–817. Bradley WG, Anderson F, Gowda N, Miller RG. Changes in the management of ALS since the publication of the AAN ALS practice parameter 1999. Amyotroph Lateral Scler Other Motor Neuron Disord 2004;5:240–244. Groeneveld GJ, Veldink JH, van der Tweel I, et al. A randomized sequential trial of creatine in amyotrophic lateral sclerosis. Ann Neurol 2003;53:437–445. Shefner JM, Cudkowicz ME, Schoenfeld D, et al. A clinical trial of creatine in ALS. Neurology 2004;63:1656–1661. Desnuelle C, Dib M, Garrel C, Favier A. A double-blind, placebo-controlled randomized clinical trial of alpha-tocopherol (vitamin E) in the treatment of amyotrophic lateral sclerosis: ALS Riluzole-Tocopherol Study Group. Amyotroph Lateral Scler Other Motor Neuron Disord 2001;2:9–18. Graf M, Ecker D, Horowski R, et al. High dose vitamin E therapy in amyotrophic lateral sclerosis as add-on therapy to riluzole: results of a placebo-controlled double-blind study. J Neural Transm 2005;112:649–660. Heffernan C, Jenkinson C, Holmes T, et al. Management of respiration in MND/ALS patients: an evidence based review. Amyotroph Lateral Scler 2006;7:5–15. Lechtzin N, Rothstein J, Clawson L, Diette GB, Wiener CM. Amyotrophic lateral sclerosis: evaluation and treatment of respiratory impairment. Amyotroph Lateral Scler Other Motor Neuron Disord 2002;3:5–13. Melo J, Homma A, Iturriaga E, et al. Pulmonary evaluation and prevalence of non-invasive ventilation in patients with amyotrophic lateral sclerosis: a multicenter survey and proposal of a pulmonary protocol. J Neurol Sci 1999;169:114–117. Czaplinski A, Yen AA, Appel SH. Forced vital capacity (FVC) as an indicator of survival and disease progression in an ALS clinic population. J Neurol Neurosurg Psychiatry 2006;77:390–392. Jackson CE, Rosenfeld J, Moore DH, et al. A preliminary evaluation of a prospective study of pulmonary function studies and symptoms of hypoventilation in ALS/MND patients. J Neurol Sci 2001;191:75–78. Elman LB, Siderowf AD, McCluskey LF. Nocturnal oximetry: utility in the respiratory management of amyotrophic lateral sclerosis. Am J Phys Med Rehabil 2003;82:866–870. Velasco R, Salachas F, Munerati E, et al. [Nocturnal oximetry in patients with amyotrophic lateral sclerosis: role in predicting survival] [in French]. Rev Neurol 2002;158:575–578. Lechtzin N, Wiener CM, Shade DM, Clawson L, Diette GB. Spirometry in the supine position improves the detection of diaphragmatic weakness in patients with amyotrophic lateral sclerosis. Chest 2002;121:436–442. Varrato J, Siderowf A, Damiano P, Gregory S, Feinberg D, McCluskey L. Postural change of forced vital capacity predicts some respiratory symptoms in ALS. Neurology 2001;57:357–359.